Comfort: Suspension setup is much more decent as compared to the previous generetion. Chairs can be adjusted in quite a bit of angle to your body posture. Engine noise is quite minimal. The spaciousness is a no brainer. Reliability: I can say that the gearbox is much improved as compared to it's predecessor 2.4L generations. When put gear to P, parking brake auto engage. Dashboard can display Digital Speedometer. Hybrid Version: it shows the engine RPM as an option. Cool! Easy board and get off. 2.5 is insufficient to push this elephant. However it's decent along the expressway. bumper is too low, easily scratched while negotiating a turn. rear view mirror is small. but it's OEM anyway. Toyota don't bother to make their own mirror. U turn is a challenge. Legit. 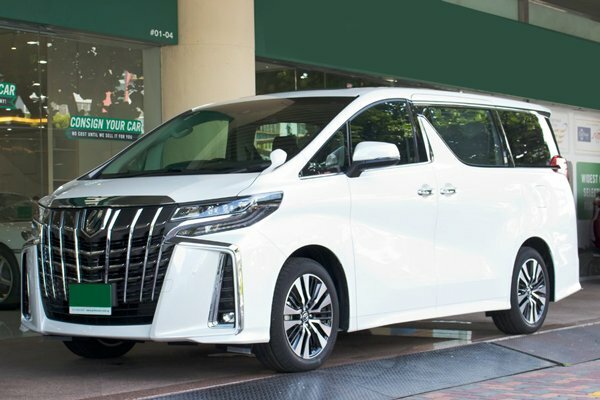 The Toyota Alphard has long been a car recognised for ferrying 'towkays' around town. Although I am no 'towkay,' space, comfort and reliability are my priorities when it comes to choosing a family car due to the fact that I have four children. The new Alphard proves to be an icon of the factors mentioned above, hence my decision to have a look at it last weekend. I have never owned one of these things before and I am thoroughly impressed by the amount of space it has to offer. The third row seats aren't something to chuck your kids into but it can actually comfortably fit a pair of adults. Interior quality is well-built too, kudos Toyota! - A new double wishbone suspension is used for the rear, translating into a luxurious, comfortable ride with stable handling. - The 2.5-litre engine lacks a bit of punch, would be great to have the 3.5-litre V6 engine. Authorised Distributor Toyota cars are Toyota Alphard Reviews, Toyota C-HR Reviews, Toyota Camry Reviews, Toyota Corolla Altis Reviews, Toyota Fortuner Reviews, Toyota Harrier Reviews, Toyota Previa Reviews, Toyota Prius C Hybrid Reviews, Toyota Prius Hybrid Reviews, Toyota Prius+ Hybrid Reviews, Toyota RAV4 Reviews, Toyota Sienta Reviews, Toyota Vellfire Reviews, Toyota Vios Reviews. Parallel Imported Toyota cars are Toyota C-HR Reviews, Toyota C-HR Hybrid Reviews, Toyota Camry Hybrid Reviews, Toyota Corolla Axio Hybrid Reviews, Toyota Dyna 150 Reviews, Toyota Esquire Reviews, Toyota Esquire Hybrid Reviews, Toyota Estima Reviews, Toyota Estima Hybrid Reviews, Toyota Harrier Reviews, Toyota Hiace Reviews, Toyota Hiace High Roof Reviews, Toyota Hiace Mid Roof Reviews, Toyota Hiace Standard Roof Reviews, Toyota Hilux Reviews, Toyota Hilux Double Cab Reviews, Toyota Land Cruiser Reviews, Toyota Land Cruiser Prado Reviews, Toyota Land Cruiser Prado Diesel Reviews, Toyota Land Cruiser Utility Commercial Reviews, Toyota Liteace Reviews, Toyota Noah Reviews, Toyota Noah Hybrid Reviews, Toyota Prius Alpha Hybrid Reviews, Toyota Prius Hybrid Reviews, Toyota ProAce Reviews, Toyota Sienta Reviews, Toyota Sienta Hybrid Reviews, Toyota Tank Reviews, Toyota Vellfire Reviews, Toyota Vellfire Hybrid Reviews, Toyota Voxy Hybrid Reviews, Toyota Voxy Welcab Reviews, Toyota Wish Reviews. sgCarMart is the number one car site for buying Singapore cars, including new cars, parallel import cars, Toyota, Honda, Nissan, Volkswagen, Mitsubishi & BMW. We have new car dealers comprising parallel importers, authorised car distributors, and used car dealers who have the New Toyota Alphard latest price Find new car pricelists, new car launches, new car promotions, new car reviews, latest car news & car articles. Read the New.Toyota Alphard consumer reviews to help you decide on buying a car. Also join our car discussion and forum discussion for car reviews, motoring news & motoring guides. Visit our partner sites who have job openings for Singapore jobs, Singapore classifieds, mover and real estate properties for sale.